What makes my collagen different to the others? First of all it’s 100% PURE and has NOTHING ADDED to it whatsoever. It is also shelf-stable for SIX years. Therefore it’s not diluted with all sorts of other things which push the price up for you and bring the price down for the manufacturer, a common practice. Some time ago I decided to take collagen and could not find a SINGLE SOLITARY pure one on the shelves in this country, so I had to bring in my own brand to make sure I got PURE collagen, and not a pile of things I really didn’t want. I wanted NO dangerous chemicals, colourants, artificial sweeteners and sugar galore. Some companies even have to add in freebies of other products to get you to buy them, and we have NO idea what’s in that pot! They won’t tell us. That sends alarm bells ringing for me! This morning I did a very quick internet search of some of the common collagen supplements on the market and want to share with you some of the many reasons I personally choose never to use them. And incidentally – ALL that follows is freely available for all to see on the internet – I’m not telling you anything new here, yobillu can do your own research, and you’ll probably turn up even more nasties. COLLAGEN BRAND #1 – on the internet I can only find “information not available” (alarm bells) but if I remember correctly – I did see an ingredient list which said it had sucralose (a toxic ingredient) and a few other things in it. I need to go into a store and turn the bottle round as it seems nobody on the internet has the information of exactly what is in this product! COLLAGEN BRAND #3 – Heck – the IDENTICAL mixture here down to the last word as shown in Collagen Brand #2!! !! See Collagen Brand #2 above – clearly the SAME product under a different label. E110 is used as a synthetic colouring agent in food and drink – called SUNSET YELLOW FCF and ORANGE YELLOW S (common names. It is a synthetic azo dye thought by some to worsen asthma, and when taken in combination with benzoates (found in loads of food by the way) to induce HYPERACTIVITY in children. Individuals with intolerance to salicylates may also find they are intolerant to E110 due to the colouring being an azo dye. Some side effects: nausea, vomiting and it is BANNED in Norway. You already know about E110 from #4 above, but did you know about the others? E122 is quite serious I think… A RED SYNTHETIC COAL TAR FOOD COLOURING, also thought to worsen asthma and to cause allergic reactions in individuals allergic to ASPIRIN. When taken in combination with benzoates E122 is also suspected to cause hyperactivity. BANNED in USA, SWEDEN, NORWAY AND AUSTRIA. There are numerous other kinds of collagens made from fish and pork collagen which I’m still not comfortable with – but the one I have is bovine (beef) and both Halaal and Kosher Certified, Grass-Fed and Certified Non-GMO. It is PURE and 100% – nothing at all added so that you don’t get a diluted product. NOW do you know why my brand of PURE HYDROLYSED COLLAGEN – free from ALL additives – is taking the country by storm? And why people are responding so well with such amazing results? 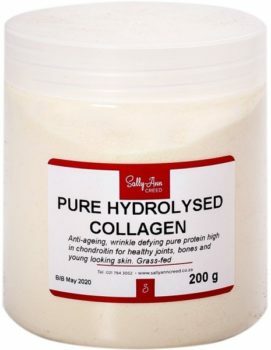 You can get your Pure Hydrolysed Collagen from my online store at https://sallyanncreed.co.za/product/collagen/. It is still the least expensive and best collagen on the planet in my opinion. The price will remain stable till the end of the month when VAT goes up and petrol forces the price up I suppose… sob.